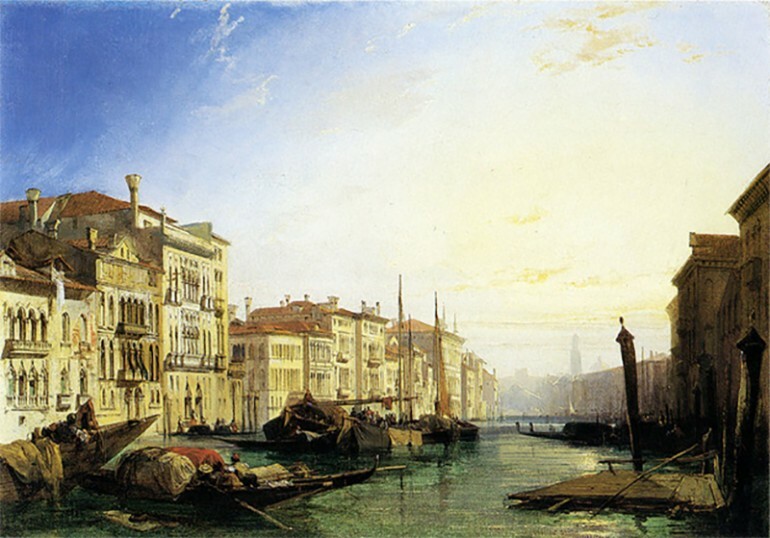 Richard Parkes Bonington was born in Arnold, England on October 25, 1802. In terms of English landscape painting, he ranked third in importance after JMW Turner and John Constable. Compared to these two prominent English artists, Bonington had a very short art career for he died at age 26. Despite his short career, he created works that were quite comparable with Constable and Turner. Although he was an Englishman, his landscape paintings showed mainly the rivers and coast scenes in France, where he spent most of his life. His works were characterized by his delicate handling of paint, very clear atmosphere, bright color and tone, and fresh naturalism. 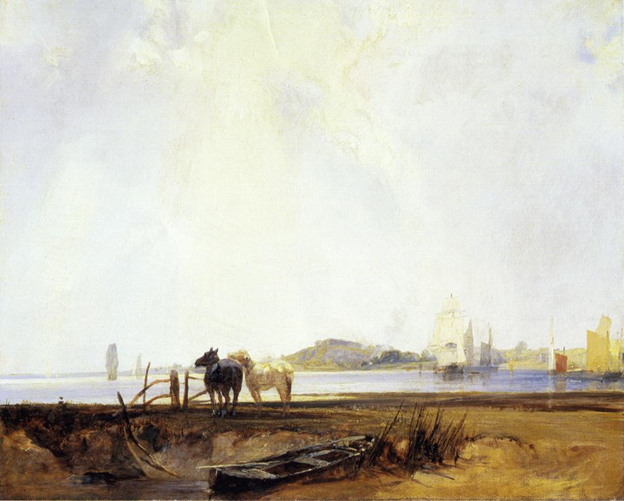 Richard Parkes Bonington was a Romantic landscape painter who was noted for introducing watercolor landscapes and plein air painting in France, together with his friend, John Constable. Bonington’s father was a lace maker and drawing master and it was from him that the young Richard learned watercolor painting. By the time he was 11 years old, the young Bonington had his first exhibit at the Liverpool Academy. They moved to Calais, France when he was 15 years old. In France, he took lessons from François Louis Thomas Francia who taught him the technique of English watercolor painting. The following year, 1818, he met Eugène Delacroix who led the French Romantic art movement, during his trip to Paris. The two became lasting friends. For a brief period, Bonington produced watercolor copies of Flemish and Dutch landscapes in the Louvre. Two years later, he started taking lessons at the École des Beaux-Arts in Paris. He joined the Paris Salons in 1824, where he won his first medal. Bonington was one of 19th century’s most talented modern artists and a highly skilled watercolorist. He and John Constable were the English artists who spurred the interest and received the most recognition from the art circles in 1824. It was in the same year that Bonington produced a series of lithographs, a collection called “Normandy, Picturesque and Romantic Tours of Old France.” Due to this he has to make several trips to Scotland and England in 1825 together with Delacroix. They also traveled to the north of France, producing landscapes showing the ports and coast of Normandy. “At the English Coast” (watercolor) and “Normandy Beach Scene” (oil), which were some of his best works, were created during his trips. These paintings showed his interest in the atmospheric effects of color and light, which made the sky the main and most essential element is his landscape paintings. The artist was also very interested in color and his works were always luminous and brilliant, with some focus on chiaroscuro. Even when painting in oil, his brushworks were perpetually delicate, which was a result of his technique in using watercolor. One best example was “The Park at Versailles” that was painted directly from outdoors. Bonington’s life was cut short by tuberculosis. Due to the influence of Delacroix, he created some historical paintings. In art history he was most important because of his technique and naturalistic concept for landscapes, which had a major influence in some of the artists of the Barbizon school and some Impressionist painters such as Claude Monet. While he was constantly exposed to French painting, his style remained personal and unquestionably English.